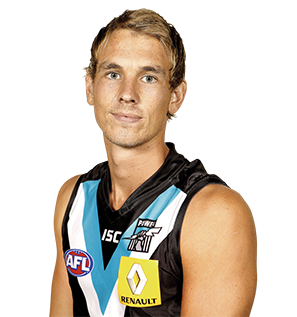 Ken Hinkley has confirmed versatile defender Nathan Blee will play his first game for 2013, exactly a year to the round from his AFL debut. A capable defender who can move forward as well, the 191cm Blee will look to feature as a regular in the Power side as he tries to build on the four games he finished season 2012 with. Blee was drafted to Port Adelaide from WAFL side East Perth following some impressive performance in the Western Australian league. A slightly older draft pick, Blee nonetheless repaid the faith shown by Port Adelaide recruiters when he debuted in Round 20 against Hawthorn on the back of several strong weeks in the SANFL with North Adelaide. While he was put up against some of the best forwards in the competition, the 22-year-old was able to perform reasonably well under pressure and has built a foundation for a strong pre-season with a view to claiming a regular spot in the senior side moving forward.